Find phlebotomy training classes in New York below! The mounting growth in population coupled with the proportionate growth of lab tests ordered by physicians in accordance with biotechnology advances have contributed to the rising demand for phlebotomists. Phlebotomists are professionals in the healthcare setting whose job is to draw blood and other blood components from blood donors or patients for therapeutic processing and testing. The phlebotomists’ career is not just confined in the hospital setting but their line of duty is also needed within and around large medical offices, clinics, home health agencies, and HMO’s. The Certified Phlebotomy Technician program offered by Bryant & Stratton College prepares students to challenge the examination on Certified Phlebotomy Technician which is a national permit for phlebotomists to work legally in the medical field. Phlebotomy is one of the many high-demand health care professions today. This occupation entails knowledge, proper and safe application of venipuncture which is a multi-faceted procedure. This is among the many training programs that Trocaire College offers. The program also comprises of orientation at a full service laboratory at associated hospitals and at least 120 hours of clinical duties on techniques of blood collection. What are the traits and skills expected of a phlebotomist? • Can stand for lengthy time periods. What are some of the routine duties of a phlebotomist? • Obtain the needed specimens for testing via venous or capillary, depending on what is required. • Complying with revised or new procedures as established in procedure manuals of the organization. Due to the continuous healthcare advances and the growing number of patients that need care, there is also an equal growth in the demand for well-trained phlebotomists. Currently, the work opportunities for phlebotomists are way more than what the current job pool can meet. What are the critical roles of Phlebotomist professionals in the medical setting? At the Noyes Memorial Hospital, all these critical roles of a phlebotomist will be taught to its phlebotomy students. The phlebotomy training program offered by this school provides the student with the proper skills and knowledge in order to perform phlebotomy roles successfully. Further, the training also preps the student for the national certifying examinations that will enable them to practice phlebotomy professionally. The LaGuardia Community College (LGCC) offers Phlebotomy Courses to interested students. In order to become a certified phlebotomist, you need to successfully complete this course. Once course completion is successful, the graduate is now eligible to take the national phlebotomy technician certification which when passed successfully, makes the student a certified phlebotomist. In order to successfully complete this course, the student needs to accumulate at least 35 live blood draws during his or her practical skills lab, aside from completing the in classroom lessons. Suny Orange offers a 16-weeks course on Phlebotomy which consists of 210hours of lecture and training. Training and lessons would include: laboratory procedures, anatomy, medical terminology, approved safety methods, handling and drawing of samples of blood for lab testing in various settings like large service laboratories, doctor’s office, and hospitals. What are the requirements to enroll in this Phlebotomy Course? • Student must present a complete physical examination which would include a 10 panel drug screen, proof of immunity against varicella, rubella, mumps, and measles plus a Tuberculosis screening. • GED or a high school diploma is mandatory. • Attendance to the pre-admission orientation is also a must. Once all requirements of the course are met, the student is now eligible to become a certified phlebotomist by challenging the National Certification Examination. Location: 312 W 36th St.
All these topics included in the phlebotomy course will help students to successfully pass the Phlebotomy certification examination proctored by the National Healthcareer Association. The Center for Workforce Development offers phlebotomy courses that span a total of 124 training hours. 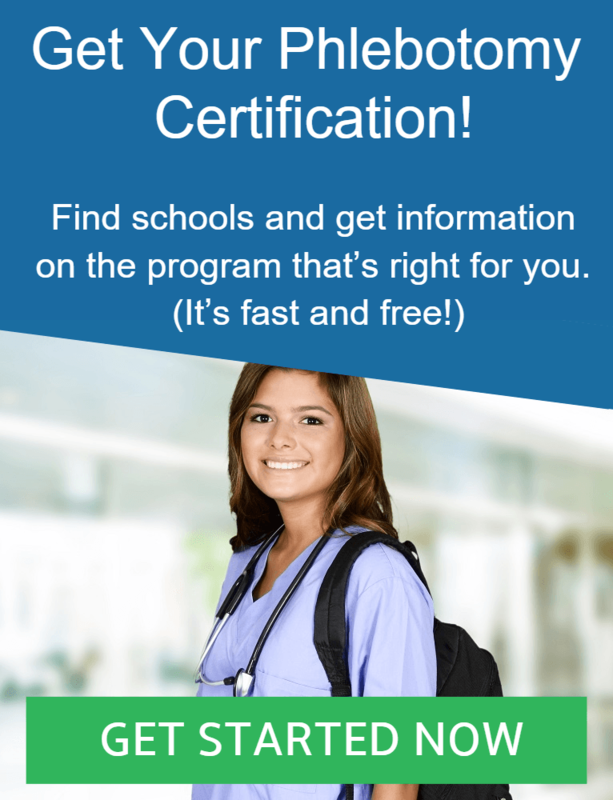 The only prerequisite needed to enroll in the program is a high school diploma or its equivalent. Aside from the lessons and training included in this course program, it also includes basic computer literacy and employment skills development. Once this course program is completed, the student is well-prepared to start an entry level phlebotomy job. • Understanding the role of a phlebotomist in the health care setting. The scope of the instruction would comprise of learning and training in various areas like: employment skills development, non-invasive skills, dermal puncture, venipuncture, specific skills like hygiene and work ethics, foundation knowledge, legal issues, safety, and definition of job opportunities and roles.